The processes of inspiration and expiration are vital for providing oxygen to tissues and removing carbon dioxide from the body. Inspiration occurs via contraction of muscles such as the diaphragm, whereas expiration tends to be passive at rest. This process changes slightly when breathing is forced. This article shall discuss the process of inspiration and expiration at rest, how this changes during forced breathing and relevant clinical conditions. The lungs are enveloped in parietal and visceral pleura and the space between the lungs and thoracic wall is called the pleural space. This is usually filled with pleural fluid which forms a pleural seal that holds the outer surface of the lungs against the inner surface of the thoracic wall. This ensures that when the thoracic cavity expands or reduces, the lungs move with it due to the surface tension of the pleural fluid forming the pleural seal. Boyle’s law states that, when temperature is constant, the volume of gas is inversely proportional to pressure. Therefore, when the lungs expand increasing the volume of air within them, pressure declines. When the pressure of the air outside the lungs is greater than the air inside, air will rush into the lungs, and vice versa. When the diaphragm contracts, it flattens, pressing down on the abdominal contents and lifting the thoracic cavity. This leads to an increase in the volume of the thoracic cavity. 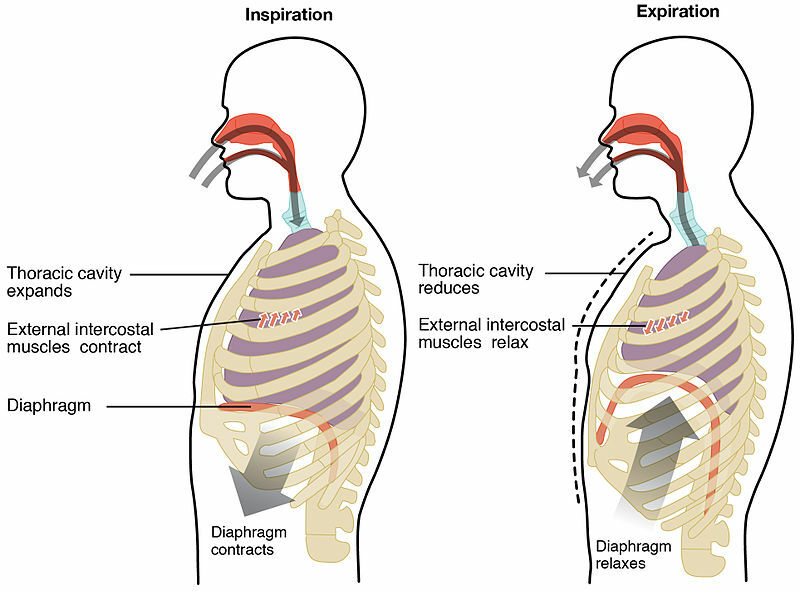 The diaphragm is the most important muscle in inspiration as it amounts to 60 to 80% of the work in ventilation. Fig 1 – Anatomical position of the diaphragm. Fig 2 – Diagram showing the process of inspiration and expiration at rest. Forced breathing requires active inspiratory and expiratory effort with the help of accessory muscles. This is similar to normal inspiration (diaphragm and external intercostals) but requires effort from the inspiratory accessory muscles such as scalenes, sternocleidomastoid, pectoralis major and minor, serratus anterior and latissimus dorsi. Unlike normal expiration, this is an active process. It involves contraction of the abdominal muscles which forces the diaphragm upwards reducing the volume of the thoracic cavity. It also requires contraction of the internal intercostal muscles and innermost intercostal muscles which pull the ribs downwards. Both these actions contribute to a decreased thoracic volume and pressure is inversely proportional to volume. Therefore pressure within the lungs increases forcing the air out quicker than in normal expiration. The phrenic nerve (C3, C4, and C5) innervates the diaphragm and if this nerve is damaged, the movements of the diaphragm are disrupted and in severe cases the diaphragm may be paralysed. Since it is the most important muscle in inhalation (60 to 80% of the effort), breathing is severely affected and patient may report symptoms of breathless and even respiratory distress. If possible the underlying cause should be identified and treated, although this may not be possible in the case of surgical damage for example. Management also consists of providing symptomatic relief, which typically occurs through non-invasive ventilation, such as a CPAP (continuous positive airway pressure) machine. 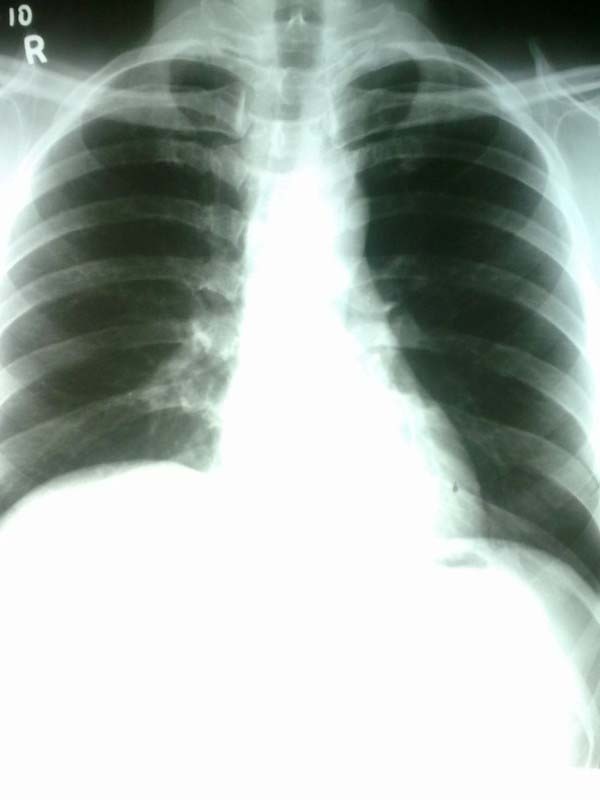 Fig 3 – Chest X-Ray showing paralysis of the right hemidiaphragm. Which of these does NOT occur in inspiration? Which of these muscles is not used in forced inspiration? Which of these is a passive process? Which does Boyles law state?